Butter the sides and the bottom of the slow cooker. Chop the remainder of the butter and place it on the bottom of the cooker. 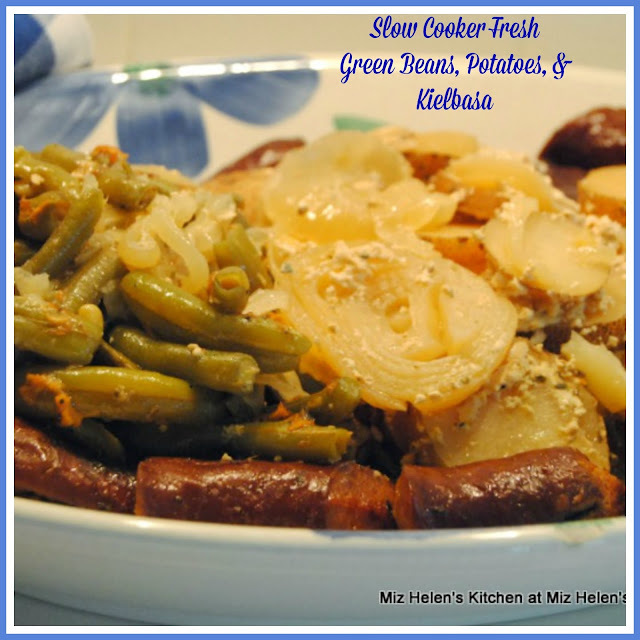 Layer the potatoes, onions, green beans and Kielbasa. Mix the half and half, salt, pepper, and dried basil together. Pour the mix over the vegetables and Kielbasa. Sprinkle the cheddar cheese over the top of the vegetables and Kielbasa. Place the lid on the Slow Cooker and cook on low for 6 hours. Thanks so much for stopping by the cottage to spend some time in the kitchen with us today. We always look forward to your visits and hope you will come back real soon! That looks so good!! I had a similar recipe I used to make...I need to print this off and remember to add it back in to rotation. Thanks! Pinning this baby - a PERFECT one pot meal!! thanks for sharing at the What's for Dinner party. Hope you have a wonderful week! This meal looks SO scrumptious! Thanks so much for sharing it at the Whimsical Wednesdays Link Party!